Have you or someone you love been touched by miscarriage, stillbirth, or other forms of pregnancy/infant loss? Join us for the Let's Not Be Still! 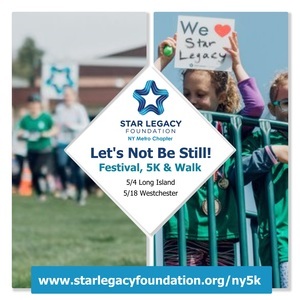 Festival with 5K & Walk on Saturday, May 18th 2019 at Meadow Pond Elementary School in South Salem, NY. 5K Run & Walk at 9:00 am - Stroller-friendly! Can't make the event? Register as a Virtual Participant and we'll mail you a shirt! Last year this upbeat, family-friendly event raised over $150,000 for stillbirth research and education while honoring all babies amongst the stars! Proceeds will benefit grassroots programs in our area and cutting-edge research nationwide. Because every pregnancy deserves a happy ending! Did you know that in the US, each year 26,000 babies – 71 per day – are stillborn? That's 10 times more than the number of SIDS deaths, and 1 in 160 pregnancies! More than half of these babies are at a viable gestational age and could have been saved, if we only knew how to recognize that they were in trouble. All money raised for this event will be donated directly to Star Legacy Foundation (a 501(c)(3) non-profit organization) for use in projects in the NY Metro area and nationally to promote education & awareness in the medical community, provide outreach to hospitals, & support families who lose a baby.